Are Cancer Screenings by an Oral Surgeon Really That Important? Your mouth and its surrounding structures are an essential part of your life. They help you eat and speak properly — and who doesn’t love a warm smile? Unfortunately, these vital body parts are in danger. Oral cancer claims thousands of lives each year. In order to avoid becoming another victim of this devastating disease, it is important that you visit your oral surgeon in Marietta for a screening. You are 55 or older. You consume large amounts of alcohol. You’ve contracted the human papilloma virus. You spend a lot of time in the sun. Of the above-listed risk factors, tobacco is the most significant; it plays a role in over half of oral cancer cases. Even if you quit smoking years ago, you may still be at an increased risk of developing this disease. What Are Some Common Symptoms of Oral Cancer? 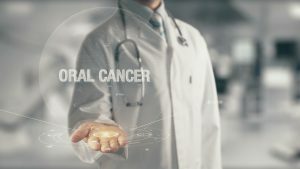 Some people do not even notice the symptoms of oral cancer until the disease has progressed to the point where it is extremely difficult to treat, which is why visiting an “oral surgeon near me” for screenings is so vital. The earlier you can catch cancer, the more likely it is that you will beat it and go on to live a long and fulfilling life. You don’t have to worry that screening will take up a huge amount of time or that it will be painful. In fact, the process is as simple as a thorough visual and/or tactile examination during which your dentist or oral surgeon hunts for signs of oral cancer. If your dental care professional notices any suspicious spots, the next step is a biopsy. An oral surgeon will collect a tiny sample of the possible cancer and test it to find out if it is anything you need to be alarmed about. Getting screened for oral cancer could save your life! Please find time in your schedule to get checked for this fearsome disease. Dr. Jeff Lee and the rest of the team at Muskingum Valley Oral surgery have your best interests at heart, which is why they perform oral cancer screenings and biopsies. If you believe you should be checked for this condition, please contact our Marietta office at 740-236-9392. Comments Off on Are Cancer Screenings by an Oral Surgeon Really That Important?